Familial hypercholesterolemia (FH) is an autosomal codominant genetic disorder of lipid metabolism. The occurrence of its homozygous form is rare. 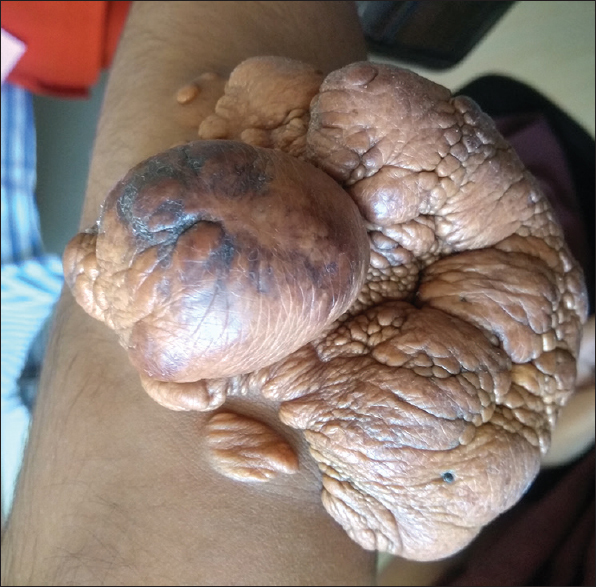 This is a case of a young girl who presented with syncope and was found to have multiple tuberous xanthomas and valvulopathy, along with deranged lipid profile, suggestive of homozygous FH. Familial hypercholesterolemia (FH) is an autosomal codominant genetic disorder characterized by an elevated level of low-density lipoprotein (LDL) cholesterol (in the absence of hypertriglyceridemia), cutaneous xanthomas, and premature coronary atherosclerosis. The condition is uncommon, with an incidence of 0.2% in general population. There are two forms of FH: heterozygous FH (HeFH) and homozygous FH (HoFH). HeFH is more common with a prevalence of 1 per 250–500 individuals, while HoFH is rare with a prevalence of only 1 in 1,000,000 population., These patients are at high risk of developing coronary artery disease (CAD) and sudden death, requiring prompt recognition and treatment. Screening of first-degree relatives also plays an important role in this condition. A 19-year-old girl presented with complaints of recurrent syncope for the past 1 year. She also had New York Heart Association Class II dyspnea and angina since 2 years. She was born of consanguineous marriage (parents were first cousins) [Figure 1]. She had normal developmental milestones. On examination, she had a low volume pulse of 98/minute and blood pressure of 110/60 mmHg. Multiple tuberous xanthomas were present over her elbows [Figure 2] and gluteal region, nodular lesions over her knuckles and intertriginous xanthomas in the web spaces of her hands [Figure 3], xanthomas over her feet [Figure 4], and xanthelasma without arcus cornealis [Figure 5]. Her cardiovascular examination revealed an ejection systolic murmur in the aortic region with radiation to the carotids and a pansystolic murmur in the mitral area conducted to the axilla. Electrocardiography had ST depression in leads II, III, aVF, and V4–6 [Figure 6]. Echocardiography showed severe valvular calcific stenosis of tricuspid aortic valve, moderate aortic regurgitation, and moderate mitral regurgitation (partly valvular and partly papillary) with the left ventricular ejection fraction of 65%. There was no regional wall motion abnormality. Severe concentric left ventricular hypertrophy was present. Tricuspid and pulmonary valves were normal with no pulmonary artery hypertension. The aorta was also normal. Her lipid profile was grossly deranged with LDL 848 mg/dL, high-density lipoprotein (HDL) 22 mg/dL, and triglycerides 50 mg/dL. HbA1c, TSH, and renal and liver functions were normal. Urine examination did not show proteinuria. Ultrasound abdomen showed Grade 1 fatty liver. Her parents and sister also had high LDL levels but no skin or cardiac lesions. Her father had arcus cornealis. Her paternal grandmother and maternal grandfather (who happen to be siblings) died of myocardial infarction at the age of 45 and 50 years, respectively. On the basis of her history, clinical findings, and lipid profile reports, the diagnosis of HoFH with valvulopathy was made. She was started on rosuvastatin 20 mg once daily (as she was not tolerating higher doses) and ezetimibe 10 mg once daily, along with dietary restrictions. She was advised aortic and mitral valve replacement. In view of the high incidence of CAD in HoFH and the need for valve replacement, the patient was also advised coronary angiogram, but she and her parents were not willing for it. Genetic studies were not done due to financial restraints and lack of availability. The probable need for LDL apheresis and liver transplantation was also explained. However, after discharge, she was lost for follow-up. FH is caused by the loss-of-function mutations in the LDL-receptor genes. As a result, there is reduced clearance of LDL from the circulation by the liver. HoFH individuals have a much higher levels of LDL compared to HeFH. HoFH is caused by the mutation of two alleles of LDL receptor. They can be classified as receptor negative (i.e., those with no LDL-receptor activity) and receptor defective (i.e., those with markedly reduced but detectable receptor activity). These patients have high LDL levels, ranging from 400 to more than 1000 mg/dL, with normal triglycerides. The presentation is usually in childhood with cutaneous xanthomas on the hands, wrists, elbows, knees, heels, and buttocks. The presence of intertriginous xanthomas is a marker of HoFH. There is a high risk of atherosclerotic cardiovascular disease in childhood or early adulthood. Sudden death is uncommon. Untreated patients rarely survive beyond the second decade. HeFH, on the other hand, is caused by the inheritance of one LDL-receptor mutant allele. The high LDL levels are usually in the range of 200–400 mg/dL with normal triglycerides. The onset of disease is from birth, and recognition is based on hypercholesterolemia on routine screening with the development of xanthomas or cardiovascular conditions. These patients have a strong family history of premature heart disease. Physical examination reveals corneal arcus and tendon xanthomas mainly involving the dorsum of hands and Achilles tendon. There are several diagnostic criteria for the diagnosis of FH. 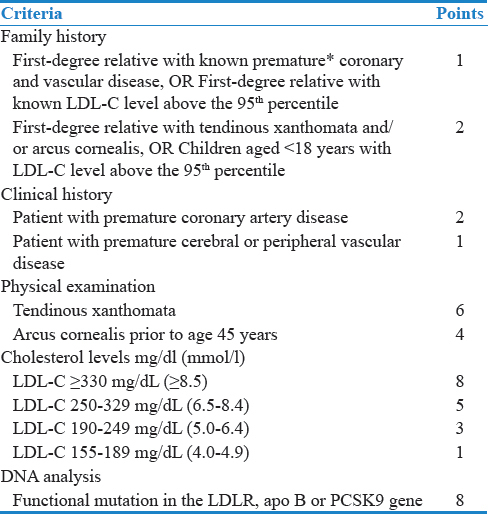 Of these, the commonly used Dutch Lipid Clinic Network (DLCN) criterion is shown below [Table 1]. A score of more than 8 is definite FH, while scores of 6–8, 3–5, and < 3 are suggestive of probable, possible, and unlikely FH, respectively. The management of FH, especially HoFH, is a challenging job. 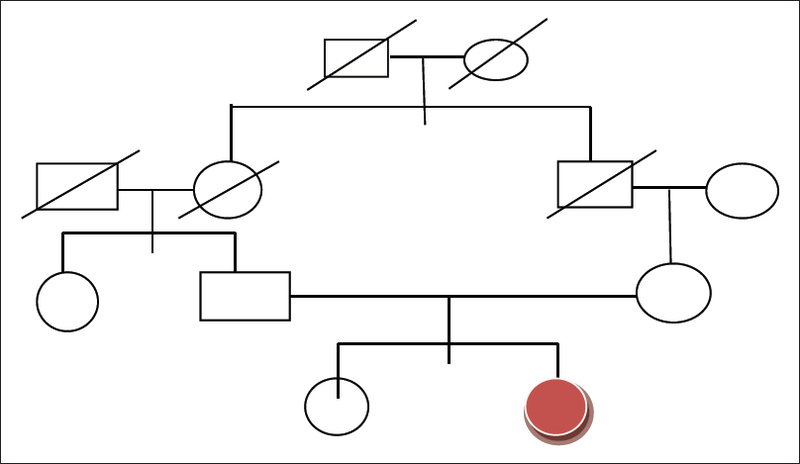 Genetic counseling is required for the patients and the families of patients diagnosed with FH. Dietary restrictions include total fat intake of 30% or less with saturated fats <10%. Saturated fats should be replaced by monounsaturated and polyunsaturated fats. Animal foods containing high cholesterol such as pork and beef should be limited. Coarse food grains, fresh vegetables, and fruits help to expel cholesterol due to their high fiber content. Soy protein may help to decrease total cholesterol and LDL levels in patients suffering from FH. Pharmacotherapy forms the mainstay of treatment. The American Academy of Pediatrics recommends that patients even below 8 years of age should be treated pharmacologically when they present with persistent LDL concentrations >500 mg/dL. Unlike HeFH, HoFH is mostly resistant to medical therapy. Statins inhibit the rate-limiting enzyme 3-hydroxy-3-methylglutaryl coenzyme A reductase required for the endogenous synthesis of cholesterol, thereby reducing the plasma concentrations of total cholesterol and LDL. Statins also cause an upregulation in LDL receptors, resulting in increased clearance of LDL from the circulation., Bile acid sequestrants, such as cholestyramine, colestipol, and colesevelam, disrupt the reabsorption of bile acid and hence decrease cholesterol levels, particularly LDL. Fibrates, such as clofibrate, bezafibrate, or gemfibrozil, are amphipathic carboxylic acids which are used along with statins. They act by inducting lipoprotein lipolysis, increasing the removal of LDL particles and increasing HDL production, and stimulating reverse cholesterol transport. Ezetimibe, a cholesterol-lowering drug, acts by decreasing the cholesterol absorption from the intestine. It may be used alone or in combination with statins. It can also cause an upregulation of LDL receptors, thereby decreasing the levels of plasma LDL. Probucol, powerful antioxidant and cholesteryl ester transfer protein activator, lowers the level of cholesterol in the blood by increasing the rate of LDL catabolism. It also inhibits the oxidation of cholesterol in LDL which slows the production of foam cells and hence prevents the formation atherosclerotic plaques. The use of probucol also resulted in decrease of eruptive and tendon xanthomas. Mipomersen, a second-generation antisense oligonucleotide, inhibits apolipoprotein B production independent of LDL-receptor function and hence effective in FH. Lomitapide, microsomal triglyceride transfer protein inhibitor, is useful in FH by reducing the LDL levels. Anti-PCSK9 (proprotein convertase subtilisin/kexin type 9) antibody reduces LDL levels and is under trials. LDL apheresis is a safe and effective option in patients with severe FH, refractory to or intolerant to pharmacological therapies, to prevent the onset or progression of cardiovascular events. Orthotopic liver transplant may provide a cure for FH by addressing the underlying deficiency, i.e., the absence of properly functioning LDL receptors in the liver. This can result in long-lasting resolution of hypercholesterolemia, atherosclerotic changes, and cutaneous xanthomas. The procedure should be done before the development of severe CAD or aortic stenosis to reduce mortality and morbidity. Our patient had a score of 16 according to DLCN, suggestive of definite FH. The diagnosis of HoFH was made on the basis of DLCN scoring, the presence of intertriginous xanthomas, and consanguineous marriage of parents. Unlike the usual presentation of cutaneous xanthomas, she had large tuberous xanthomas. Echocardiography revealed severe aortic stenosis along with moderate aortic and mitral regurgitation. She was put on statins and ezetimibe, along with dietary restrictions, but was lost for follow-up. FH in its homozygous form is a rare disease. The clinical features appear in childhood. The early diagnosis and management are essential to prevent cardiovascular events. There is a defect, reduction in number, or complete absence of LDL receptors. As a result, pharmacotherapy with statins, bile acid sequestrants, and fibrates may not be effective. However, drugs such as probucol, mipomersen, and lomitapide have shown promising results. LDL apheresis or orthotopic liver transplant can be undertaken in failure or refractory cases. Goldstein JL, Brown MS. In: Stanbury JB, editor. Metabolic Basis of Inherited Disease. New York: McGraw Hill; 1983. p. 672. Rader DJ, Hobbs HH. Disorders of lipoprotein metabolism. In: Kasper DL, Fauci AS, Hauser SL, Longo DL, Jameson JL, Loscalzo J, editors. Harrison's Principles of Internal Medicine. 19th ed. New York: The McGraw-Hill Companies, Inc; 2015. p. 2441-2. 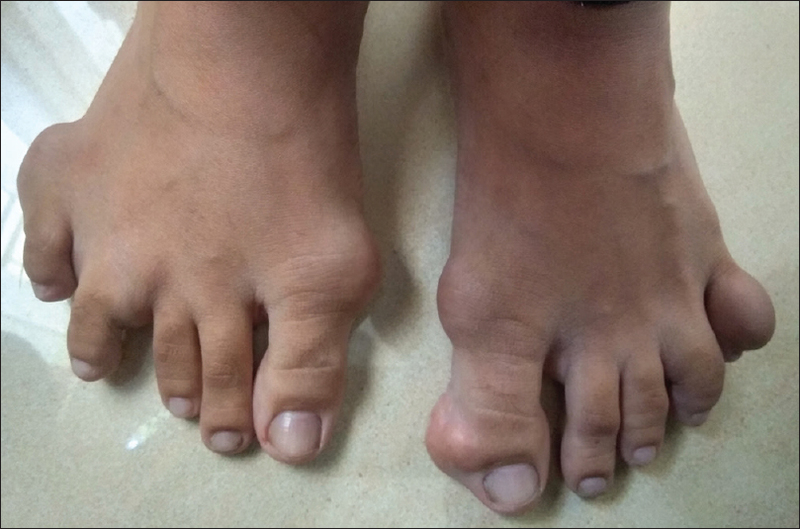 Sethuraman G, Thappa DM, Karthikeyan K. Intertriginous xanthomas – a marker of homozygous familial hypercholesterolemia. Indian Pediatr 2000;37:338. Risk of fatal coronary heart disease in familial hypercholesterolaemia. Scientific steering committee on behalf of the simon broome register group. BMJ 1991;303:893-6. 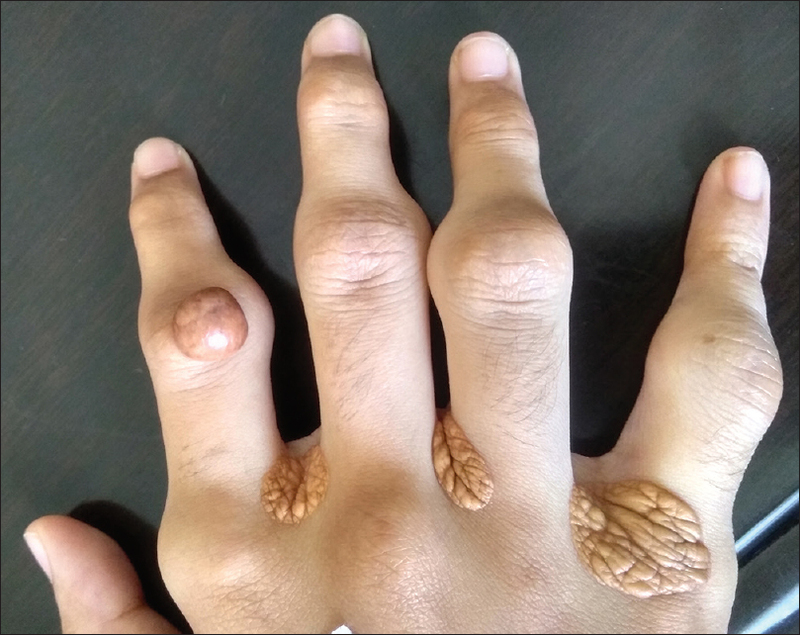 Khurana VK, Mehta RK, Chandra K. Homozygous familial hypercholesterolemia: case report and review of literature. Am J Intern Med 2014;2:34-40. Gaddi A, Ciarrocchi A, Matteucci A, Rimondi S, Ravaglia G, Descovich GC, et al. Dietary treatment for familial hypercholesterolemia – differential effects of dietary soy protein according to the apolipoprotein E phenotypes. Am J Clin Nutr 1991;53:1191-6. Daniels SR, Greer FR, Committee on Nutrition. Lipid screening and cardiovascular health in childhood. Pediatrics 2008;122:198-208. Stancu C, Sima A. Statins: Mechanism of action and effects. J Cell Mol Med 2001;5:378-87. Pocathikorn A, Taylor RR, Mamotte CD. Atorvastatin increases expression of low-density lipoprotein receptor mRNA in human circulating mononuclear cells. Clin Exp Pharmacol Physiol 2010;37:471-6. Tennent DM, Hashim SA, Van Itallie TB. Bile-acid sequestrants and lipid metabolism. Fed Proc 1962;21:77-80. Poleszak J, Korolko A. Effect of long-term administration of clofibrate on the composition of blood lipids in atherosclerotic patients. Pol Tyg Lek 1971;26:1106-9. Phan BA, Dayspring TD, Toth PP. Ezetimibe therapy: Mechanism of action and clinical update. Vasc Health Risk Manag 2012;8:415-27. Heel RC, Brogden RN, Speight TM, Avery GS. Probucol: A review of its pharmacological properties and therapeutic use in patients with hypercholesterolaemia. Drugs 1978;15:409-28. Yamamoto A, Matsuzawa Y, Kishino B, Hayashi R, Hirobe K, Kikkawa T, et al. Effects of probucol on homozygous cases of familial hypercholesterolemia. Atherosclerosis 1983;48:157-66. Parhofer KG. Mipomersen: Evidence-based review of its potential in the treatment of homozygous and severe heterozygous familial hypercholesterolemia. Core Evid 2012;7:29-38. Cuchel M, Bloedon LT, Szapary PO, Kolansky DM, Wolfe ML, Sarkis A, et al. Inhibition of microsomal triglyceride transfer protein in familial hypercholesterolemia. N Engl J Med 2007;356:148-56. Zhang L, McCabe T, Condra JH, Ni YG, Peterson LB, Wang W, et al. An anti-PCSK9 antibody reduces LDL-cholesterol on top of a statin and suppresses hepatocyte SREBP-regulated genes. Int J Biol Sci 2012;8:310-27. Lefort B, Giraud C, Saulnier JP, Bott L, Gambert C, Sosner P, et al. Treatment of homozygous familial hypercholesterolemia with LDL-apheresis on a 4-year-old child. Arch Pediatr 2009;16:1554-8. Castilla Cabezas JA, López-Cillero P, Jiménez J, Fraga E, Arizón JM, Briceño J, et al. Role of orthotopic liver transplant in the treatment of homozygous familial hypercholesterolemia. Rev Esp Enferm Dig 2000;92:601-8.